Guesthouse close to the beach, upscale without compromising its tropical warmth. Popular among the bear crowd. My partner and I stayed at Coral Reef 8 nights and had the most enjoyable time of our lives. We will return without hesitation. The owner (Wayne) and manager (Bobby) are awesome friends. Make you feel at home like family and create an atmosphere for all guests to mingle as true friends. Thanks guys. My partner and I spent 4 nights at the Coral Reef on our last trip to Ft. Lauderdale. It was a great place to relax and be pampered by the guesthouse's wonderful staff (thank you, Wayne) and owners. We were treated like family. They have a great pool and hot tub where we hung out naked most of the day soaking up the sun. The other guests were friendly and it was great going out with other fun guys we'd just met to enjoy dinner and Ft. Lauderdale nightlife. We're still in contact with several new friends we met by the pool. We will definitely stay at Coral Reef again. Out of the way.....but a great location! Immaculately clean. Very responsive hosts that do all they can to make your visit the best. The boat ride was quite a treat. Just stayed there for the 1st time and that same day made reservation for October. The staff, the place, the cleaness of the place is incredible.The staff goes an extra mile to make you feel at home. I will always go there when in Ft.Lauderdale. 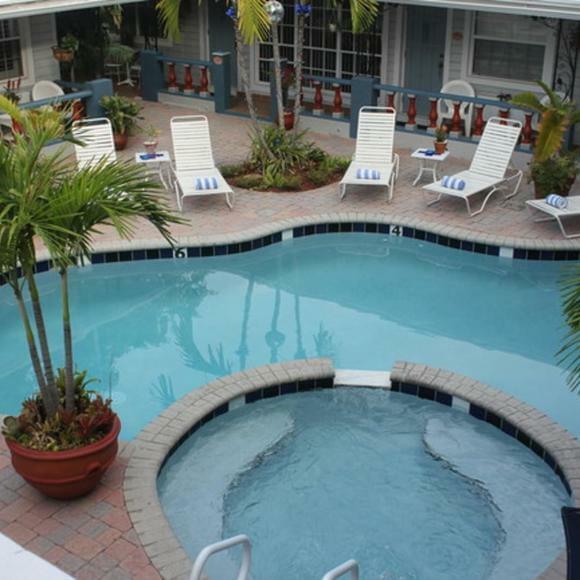 Next time you're in Fort Lauderdale, treat yourself to a stay at this guest house. It is located in an upscale neighborhood a little out of the way, but less than 15 minutes by car to downtown, airport or Wilton Manors. 5 minutes to beach by car, or take one of their bikes for a fun ride. The owners go out of their way to make you feel at home. Snacks, sodas, beer available all day. Great breakfast spread. If you're there on a Saturday, they just may treat you to a cruise on the intercoastal in the Stingray (their boat). Awesome trip. The hotel grounds are clean and feature beautiful tropical flora. Rooms are clean & comfortable.